We have put together a proactive care plan to resolve ongoing poor function and bacterial health issues of large and industrial sewage aerobic treatment systems such as Aquarius, Biomax, Fujiclean, Graf ePro and Taylex. Resolve ongoing poor function and bacterial health in large and industrial sewage wastewater Aerobic Treatment Units once and for all. Flick the switch from Reactive to Proactive Maintenance of your wastewater sewage system today! Our Dosing Plan is a peace of mind solution for offices, residentials, fast food service, aged care, function centres and managed properties where waste breakdown can become a real public health issue without proper treatment and care. We have developed the Proactive Dosing Plan in response to ongoing and frequent issues for customers who are unable to control the inputs into their large capacity wastewater sewage Aerobic Treatment Units (ATU) such as Aquarius, Aqua Nova, Biomax, Biosystems 2000, Ecomax, Graf ePro and Taylex. If you are responsible for the facility for the Aerobic Treatment Unit wastewater system in your organisation and have concerns about inputs like oils, fats and grease; chemicals, system or overuse, then talk to our team today. Our field testing of the Ecocare range has produced excellent results in improving very dirty aerobic treatment sewage systems where inputs such as harsh chemical contaminants and fats, oils and grease are not always able to be controlled. A Proactive Dosing Plan minimises loss of amenity and extraordinary expenses. Our Proactive Dosing Plan includes Ecocare Activator – a total treatment for wastewater systems and depending on the issues the system has, we may also recommend additional products. What does the Dosing System do? Our technician will prescribe a regime of recommended product depending on the needs of the wastewater system. This will include Ecocare Activator, which stimulates the health of the bacteria in the system, by providing micro and macro nutrients, additionally specialty bacteria Ecocare Culture GF may also be prescribed if there is a significant grease issue causing blockages and odours. A dosing pump unit distributes a measured amount of prescribed liquid remediation product into the ATU at regular intervals. Please be aware that the dosing system does not replace good practices onsite. We recommend always using biodegradable papers and septic safe, environmentally safe cleaners and never disposing of grease, fats, oils or alcohol down sinks. Ecowater Services provides a complete range of ATU suitable products. 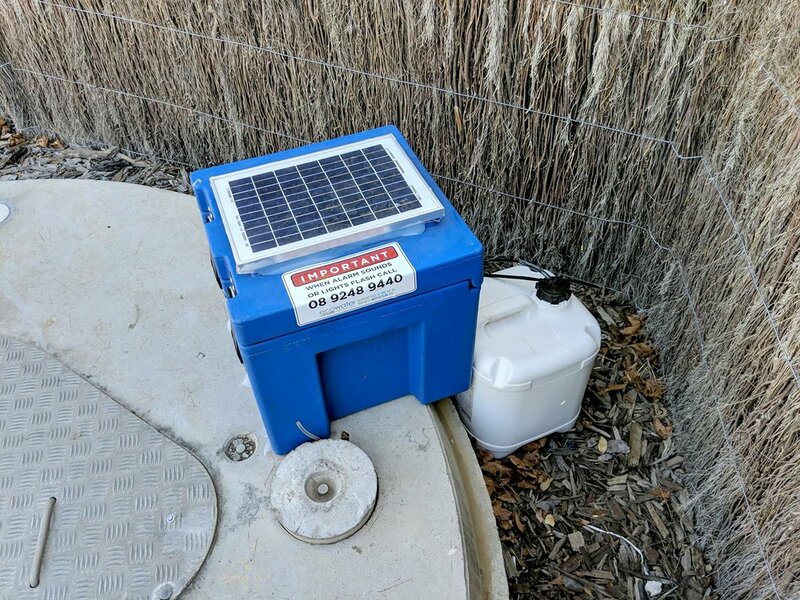 Our Proactive Dosing Plan includes lockable housing and an option for either solar charged battery or mains power connectivity.